Every fan of football is familiar with the ever expanding and imaginative dance routines and fancy footwork of our favorite NFL players. This is a great video compilation of some of the best. Enjoy the moves, the action and the incredible flexibility demonstrated by the players, to the music of “Wham” in ‘Wake me up before you gogo”. Even a mascot gets into the game with some pretty good style! The celebration dances have become a tradition within the football sport and each player adds his own unique touch to his dance of victory. Every football fan will absolutely love this video. Well presented and narrated, you will thrill at the fumbles, the slips, the slaps and the music accompaniment. Close up interviews on the various antics of the players and the coaches, and a brief history of what the most popular celebratory actions take place with the ultimate win. While there may be a few videos of the best bloopers in the NFL, this video is by far one of the most entertaining and adds that extra little touch that is needed in every game. This NFL Films presentation is one of the best documentaries on the sport. Fantastic history on the beginning process that is now one of the world’s largest sports top. Narrated by Peter Coyote, and part of a fifteen part series, every aspect of our beloved football is covered. The first beginnings of the sport were born in a painful process, and surprisingly, from people that initially didn’t know much about the game at all; but eventually became their passion. Hattiesburg, Mississippi may have a history embedded in the lumber industry, but it’s the location and beauty of the area that has drawn residents and visitors alike. 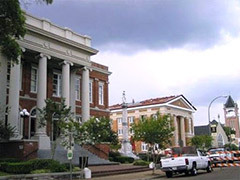 It may therefore be surprising to find out that Hattiesburg has also played an important role in U.S. Government Cold War activities and that they are avid sports fans. The University of Southern Mississippi proudly calls its home in Hattiesburg and they are proud of the M.M. Roberts Stadium, home to The Golden Eagles football team. This pride is seen at any given game, with all eyes on the football scoreboards to cheer their team on. 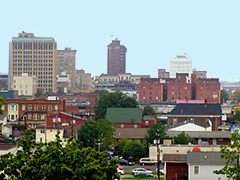 Huntington is a city blended with the rich history of the past combined with the excellence of today’s modern town. The atheletic department of Marshall University is the most grounding factor for sports in the area. The Big Sandy Superstore Arena boasts one of the best indoor football stadiums in the country. High tech football scoreboards, plenty of seats for the fans. Huntington has its roots and history well founded in the railroad. The original settlement of around 1775 was known as Holderby’s Landing. This was a very small town however it was known for their normal school, Marshall College. This school became the springboard for the future of the area, with a focus on education and advancement. Tallahassee Florida has a unique distinction of its location in the panhandle. The geography has been an advantage throughout its history, enabling it to serve as a gateway for both the State of Florida and entrance into the other states. 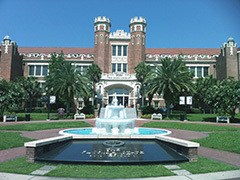 Tallahassee’s claim to fame is not just as the State Capital, but on their focus on higher education. It is the center for colleges, universities and scholastic endeavors. This is always blended with their intense love of their sports teams. As a center for college and university life, Tallahassee has some of the fiercest sports event competitions in the country. Football is one of the top games in Tallahasse, and very game is attended by overwhelming crowds with football scoreboards lit to join the excitement. Miami, Florida is a hub of sun, fun and multicultural experiences. 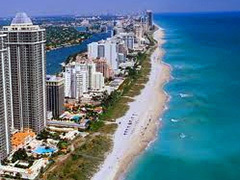 While it may be one of the nation’s largest banking centers, the beach is what is most known for. Over the years it has made many changes, but has also maintained the look and feel that is uniquely Miami. Few cities in the country have as many hot sports teams as Miami. They are known world wide for their famous football, basketball, baseball and hockey teams. But anyone in the U.S. knows that football is the name of the game in Miami. 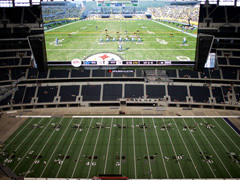 The stadiums and the highest tech football scoreboards give viewers a global view of the best games around. New Orleans may be the center of the Mardis Gras, but anyone that visits the city soon learns of the rich and harshly fought history of the people that live there. A multicultural soup of varying people and lifestyles in the heart of the south, and a city unlike anything else in the country. The staunch strength of the residents is displayed in the resounding pride of their town, because it you originate in New Orleans, you will never call anywhere else as your home. 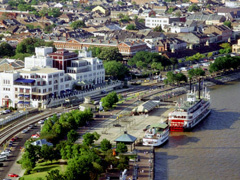 New Orleans is also host to some of the best sports teams in history. Super Bowl Football scoreboards have been lit with the intensity of games that have gone down in the halls of fame. Basketball and Roller Derby games are also nearly sold out, because New Orleans loves their sports. While you might think of Parkersburg as the home for the U.S. Department of the Treasury, there is more to this city than the government installation. This historic area of West Virginia brings the beauty of its natural landscape with the modern attitudes of today. This is a city of history, beauty and the pride in their Wood County Ravens football team. The people of Parkersburg love sports and the football scoreboards that show their team’s victories. 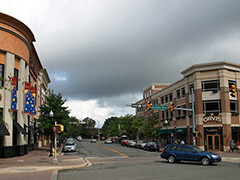 Originally named Newport, there were conflicts of opinion regarding confusion with other local towns of similar names. 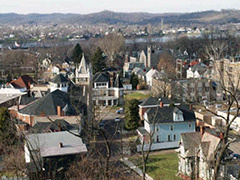 Parkersburg became a center hub during the Civil War days with its location as part of the railway service. The town prospered with added interests of both gas and oil companies. Post war days continued to bring growth to the area. 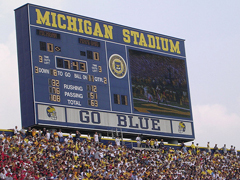 While some schools are having a debate as to whether advertising and marketing should be included on sports electronic scoreboards, Michigan Stadium seems to be completely oblivious to this argument. 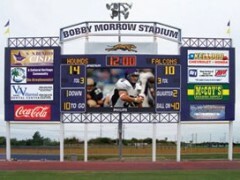 The stadium has instituted a new program to offer electronic message displays. Anyone can participate, for a price. You have to give credit to the University of Michigan. They know that their games are some of the most watched games as well as most highly attended. They are taking full advantage of that fact and offering the general public the ability to post a message, in full view of thousands of attendees and millions that view on broadcast. The U of M is encouraging people to post anniversary, birthday, and even proposals for marriage. The price is pretty reasonable. For a $200 fee, you get up to fifty characters (including spaces). They guarantee the message will be posted twice during the game: the first display will be between the first quarter and the second quarter and the second will appear during halftime ending. Each message will last a total of five seconds and there is a max of fifteen messages per game. 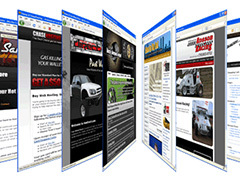 All messages are previewed for content prior to acceptance. 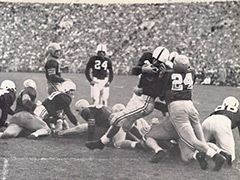 The 1961 Rose Bowl prank involving Caltech and the flip card switch is absolutely legendary. College pranks are notorious and engineering schools seem to produce some of the best of the bunch. 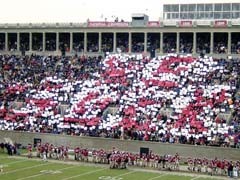 With the introduction of electronic scoreboards, the ability to introduce a whole new genre of technology oriented pranks were opened up wide; especially when considering the genius of those attending a tech college. 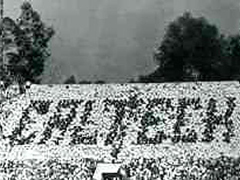 Overcoming the 1961 ordeal has become a badge of courage and, in 1984 Caltech did it again. In 1983, the president of Caltech, Even Murph Goldberger, taunted the students that they should never rely on the past results of those that were their predecessors to prove their worth. The ‘Techers’ were not going to stand by and let this challenge go and so they took it on, full force. In this football scoreboards feature, I will take a look at the most expensive football stadiums ever built. And we are talking big money! Ever wondered why that ticket costs so much? Well, partly its because the players are vastly (let’s face it!) overpaid, but partly because these stadiums just cost so much! Teams pay back stadium construction costs over decades. This NFL stadium has been voted as the most famous in America according to a variety of factors. When it was first built in 1968, it cost a massive $123 million, which was actually worth a lot more back then. However, it was a good deal for New York City itself. The city’s main train hub, Penn Station, was included with the arena project at the time. This additional expense is what has driven the price of the stadium up, and today it is worth over a billion dollars. One of the major expenses of constructing the venue is infrastructure development. Such projects require that cities change things around significantly in order to make room for the new development. However, that is not the main factor in such high costs of construction. 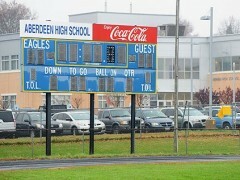 It is the more basic needs of the stadium (like football scoreboards, for example) that drive up construction budgets. Watching football is without doubt the favorite pastime in the US. It is in fact a Sunday tradition – who doesn’t love to watch a football match on a lazy Sunday when you have nothing to do other than relax?! Best of all is, of-course, if you can get to the stadium and see the game live – and truly experience the sport and the incredible atmosphere that it generates. In this football scoreboards feature, I have selected what in my opinion are the best 5 football stadiums to visit. The home stadium of the Green Bay Packers is the only arena with a true retro look in the entire league. To watch a match in the oldest football stadium is surely an amazing experience! The arena is jam packed with passionate fans cheering for their team who come out even in the extremely cold weather of Green Bay to support their team. The stadium is named after a Packer’s player, founder and coach, Curly Lambeau who died in 1965. In this football scoreboards feature, I have listed the 5 best college football stadiums ever built. They are the best because they are the most historic, the most beautiful, the most impressive, but above all, because in these stadiums, more than in any other, you can really feel the heart soul of the great institution of college football. This stadium is located on a historic site. During the Civil War, a Union Army training camp stood in its place. The Badgers will make sure you remember this fact, since each one of their games already feels like a war. The Fifth Quarter at Camp Randall will be an experience of its own – in the stands there is a 20-minute post game party, and a band plays The Chicken Dance or something silly like that. Between the third and fourth quarters “Jump Around” by House of Pain comes on, and you’d better be jumping if you happen to be there. Otherwise, you’ll be an outsider. In this feature on football scoreboards, I will present the top 5 innovations that have been implemented into football stadiums in the last few years. A lot of football stadiums may have a retractable roof, but that hardly impresses anyone anymore. The stadium at the University of Phoenix actually has retractable grass. It is possible to roll the grass in and out of the playing field, which will provide the grass with optimal growing conditions, as well as add to the venue’s versatility. This was done because the ownership firmly believed that natural grass is needed for real football. Because of the stadium’s retractable roof, it would be difficult to provide the grass with the right conditions to grow and remain healthy. So, when it is not being used for play, it can roll out of the stadium and take in all the sunlight that it needs. So, the Arizona Cardinals are the only ones to have both natural grass and a retractable roof. In this football scoreboards feature, I have taken a lot at the most environmentally-friendly NFL stadiums that are already in use, or are still under construction. If only all the NFL stadiums could go a bit greener, with tens of thousands of fans visiting them each game, it would make a huge difference to the environmental impact of the sport. 1) Ford Field, Detroit Lions’ Home. Recycled steel and recycled glass are plenty at this NFL stadium. Twenty million pounds of the former are just the beginning, since this stadium partly consists of a pre-existing building (which used to be JL Hudson Store Warehouse). The club terrazzo floors are made purely of recycled glass, and a lot of recycled rubber has gone into the construction of the parking lot. The elevator foyers and suites are constructed partially of bamboo, and the stadium is equipped with a variety of energy efficiency features. In this feature on football scoreboards, I will discuss the rules for retractable stadiums in the NFL. Even if you are the most hardened NFL who knows the rulebook inside out, I bet you don’t know these rules! Few people really so, and that is why I’ve decided to research into it and find out. An increasing amount of NFL franchises are looking into or are already building stadiums with retractable roofs. Due to this fact, a need arose for the National Football League to clarify the rules for when such stadiums are open and closed. There are certain rules the NFL has with regards to retractable stadiums, and every football team also has its own rules in their respective stadiums. In this football scoreboards feature, I have taken a look at the 7 worst NFL stadiums ever built. Old, out of date, uncomfortable, bad facilities, ugly…these are the stadiums you least want to go to to watch an NFL game. Some serious renovations are required at this stadium after the Super Bowl was held there last February. The time has finally come for the Dolphins to move to another stadium. Beer in College Football Stadiums – Is It Good or Bad? In this football scoreboards feature, I will discuss the pros and cons of selling beer at college stadiums. Roughly 35 out of 120 NCAA Division 1 schools currently allow the sales of beer to take place in their stadiums. However, many of these are limited to club-seating areas, clubs, and luxury suites. In other cases, the entire stadium will have access to beer, because it is the local sports authority that owns the facility or the city or state, and the alcohol policy is established by that body, not the school itself. A lot of colleges already have problems with underage drinking, so they frown upon having beer sold at their stadiums. This one got voted number one, as it has a wide variety of foods. The options include Taco Ma’s, Seattle Dogs, and Glo Bowl Thai. On top of that, the choice of beer is also excellent – you can get Coors and Miller, as well as Red Hook ESB, Curve Ball, Amberweizen, IPA, and Hefeweizen. Qwest field also boasts a huge selection of international options. The Green Bay Packers have a great place to call ‘home’. This is one of the oldest stadiums in the league, and not matter what the football scoreboards show, it is always full of passionate fans, who will endure any kind of cold just so they can watch their beloved Packers play. Lambeau’s Frozen Tundra has an unmatched game environment and it 3 Super Bowl championship teams have come to consider it home. In this football scoreboards feature I have looked into the 5 worst sports stadiums ever built. I’ve been to them all – and there for each of them there is at least one good reason why they made this list! This one has been referred to as the worst stadium in the U.S. by some. The main problem with it is that it was designed for more than one sport – mainly football and baseball. Of course, the fundamental issue is that the field shape for these two sports are different! Baseball fields are supposed to be diamond-shaped and football fields are rectangular. So, both sports games suffer as a result. For example, it is difficult for some baseball fans to relax and watch a game – they’ll probably sooner hurt their necks! It’s no picnic of football fans either, even if the football scoreboards show great results. Also, the use of plastic for the rails and chairs gives it a terrible feel and a total lack of character. In a football scoreboards feature, I have taken a look at the offensive lineman/tackle position in the NFL combine. If you are an offensive lineman and you want to make a lot of money in the NFL, then the best way to do that is to protect your quarterback like he was your mother, especially at the premier position of left tackle. In order to achieve this goal, your first step must be to ace the offensive lineman drill called the “kick slide” drill at the combine and impress the team representatives into drafting you. The 2011 NFL Combine – The Workout Drills and What the Coaches are Looking For. Think of the NFL Combine as a very vigorous and intense 4 day long job interview for the prospective drafts. College students from across the US gather at Indianapolis where scouts, coaches, executives and even doctors from all the NFL teams come to draft potential athletes. The combine is a mixture of various drills and workouts which every player has to undertake. The top athletes are always grabbed right off the shelf, so to speak. In this article, we will take a football scoreboards look at the various workout drills that the combine sets up for the athletes to go through and what exactly the scouts, coaches and everyone else is looking for in a player. Last week we dedicated a series of football scoreboards articles explaining the various workout drills and the Quarterback position drills that are a part of the NFL Combine, and what the team representatives and coaches are looking for in an athlete. This week, I have taken a look into the Running Back and Wide Receiver/Tight End position drills at the Combine. As ever this year’s draft showcased some incredible talent who seem destined for fame and fortune . In a football scoreboards feature, I have brought together the most promising prospects from this year’s draft, who just might be the next Superstars of the NFL. In a football scoreboards feature, we look at the NFL heroes with the golden boots, and ask, how is the greatest ever? If there ever was a position in the sport of football that was considered to be “just” a position, it is that of the kicker. This position is perhaps the least appreciated and least respected in the history of the game. The kicker’s responsibility may seem to be very simple and meager but, in reality, even though the kicker comes in to play less frequently than the other positions, it is the most pressurized position of all. The precision of the kicker’s kick is vital for the success of the team, hence the immense pressure. The NFL has seen scores of fantastic defensive players over the years, although they do not get the same credit as the offensive players. They changed the way the defence played the game with their skills and instincts, and are known as the rear-guard legends of the game. In a football scoreboards feature, we look at the current top-five defensive players the opposition quarterbacks hate the most. In a football scoreboards review, we list the five most downright nasty players currently plying their trade in the NFL. It is essential for a team to have a strong defense and at times the defense is even more important than the offense, and on many occasions teams with a weak offense but a brilliant defense have gone on to win the toughest of matches. With the sport getting more and more brutal each year, a defensive player’s strength and ability may be the thing that separates the team from a win or a loss. With 2010 almost over, we have written a special football scoreboards review of the top defensive players this season. Below is the list of the top defensive players of the NFL this year. In a football scoreboards feature, we talk about the not well known fact about NFL players’ pay, and listed the top 4 best paid players in the game at the moment. Among all the excitement and drama that follows a professional sports player around, none of it is perhaps more interesting for the fans to gossip about than the contract their favourite player has just signed and how many 0’s (zeros) are involved. 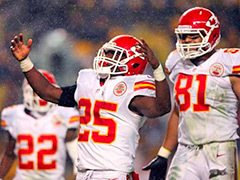 In a football scoreboards feature, we take a look at the 3 biggest catches in NFL history. It is difficult to dub a particular game as the greatest ever played in NFL history, but some games are extremely close and are balancing on a knife’s edge. 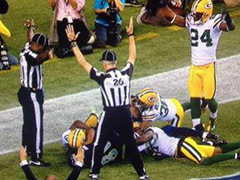 It is often such games, when a player pulls off a remarkable play, that become etched into everyone’s memory. In a football scoreboards feature, we look back at the most infamous and brutal injuries the NFL has ever witnessed. It is a loss beyond words for a professional athlete when his or her career comes to a sudden end due to an injury he/she suffered on the field or on the court. Among all the professional sports, football is probably the most brutal contact sport in the world. Injuries are second nature to the game; it is like a right of passage for all football players to go through and get injured while on the field.